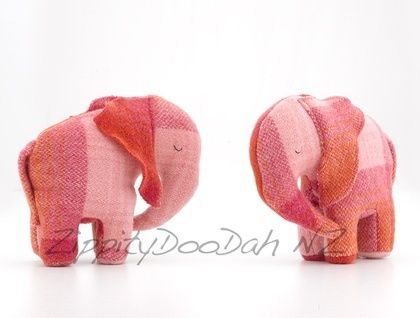 Vintage Blanket Ellies ( baby elephants) are handmade to my own design from vintage NZ wool blankets that I have felted. 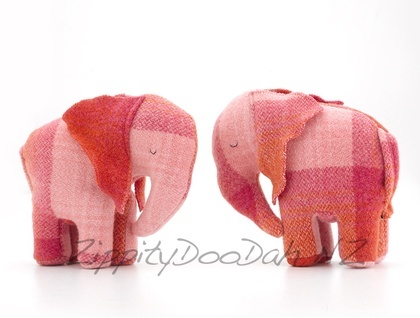 Each elephant has hand stitched sleepy eyes , a wee tail and a lovely curved trunk that is just the perfect shape for small hands to grasp. Ellies can stand up by themselves and look great on a shelf when they are not busy doing what toy elephants do. Each Ellie has delightful flappy ellie ears just like a real African Elephant. Ellies are completely baby safe and stuffed with new polyfill. Please note I usually have a good stock of Ellies in a wide range of colours so let me know if you would like a boy / girl / or unisex ellie in another colour and I can send you additional photos of other elephant colours that are in stock. I usually have ellies available in the same fabrics as my hotwater bottle covers.